The Scottish plant hunter David Douglas is best known for introducing that giant of a tree the Douglas Fir to Britain (aka the Oregon pine or Pseudotsuga menziesii). 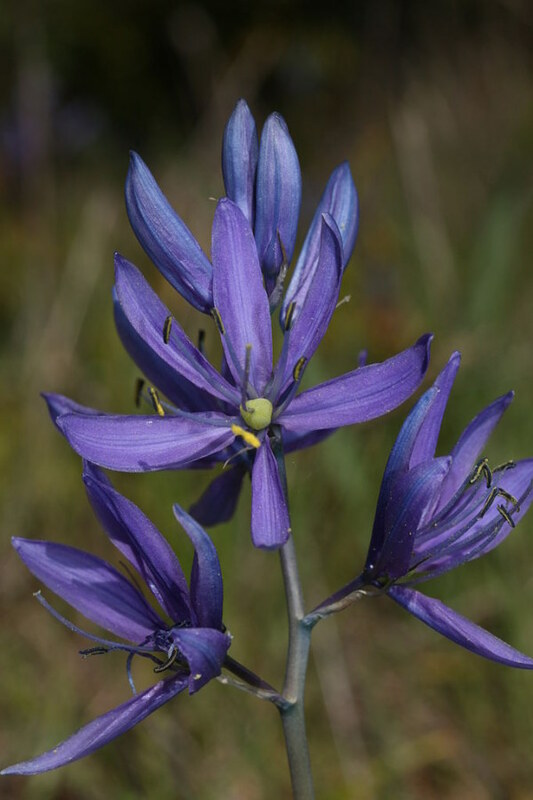 But on the same expedition he also brought to Europe the diminutive Camassia quamash. In the wild it grows in open meadows and prairies, mainly in the Pacific Northwest. The bulbs of the plant were an important food to native Americans. Meriweather Lewis and William Clark learned about the usefulness of the plant on the homeward journey of their expedition through north-west America at the beginning of the nineteenth century and it became an important food source for members of the expedition. Their records describe huge colonies of the plant growing on the Weippe prairie in what is now Clearwater County, Idaho. It grows to just 40cm (16in) tall, much shorter than most of the genus. There are usually eight to ten bright blue flowers to each stem and clear yellow anthers that seem to enhance the intensity of the blue petals. The main flowering time is mid-May. The stems are thin and wiry but nevertheless strong and can hold their own amongst the most vigorous of short grasses. This makes it one of the easiest Camassias to naturalise in meadows. They spread slowly at first but after a few years they will have seeded themselves with abandon. The late Christopher Lloyd planted them in the grass at the front of his house at Great Dixter, where they spread amongst species tulips and early-purple orchids. It is a breathtaking sight.